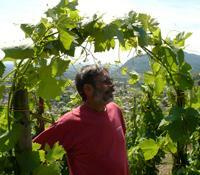 In the world of wine, there are many good winegrowers. However, there are only a very select few who are truly great, and Auguste Clape is among them. Critics and connoisseurs alike all agree that he is one of the greatest pioneers of the Northern Rhône, and his Syrahs from the cru of Cornas are among the most celebrated wines of France. The Clapes have been vignerons for many generations, but the infamous grower strikes of 1906 and 1907 forced his grandfather out of the Languedoc and into the Northern Rhône to start anew from practically nothing. The Clapes rebuilt their fortunes, terrace-by-terrace, along the steep, western slopes of the Rhône River. For many years, the majority of growers in Cornas sold their fruit to négociants. Auguste was the first to bottle his own wine, which eventually paved the way for such contemporary superstars as Thierry Allemand. Without pretense or fanfare, Auguste, the former mayor of Cornas, is a stately picture of grace and magnanimity--a no-nonsense wise man who is still interested in learning. Today, he works side-by-side with his son, Pierre-Marie, and grandson, Olivier. Wine Advocate 91-94I tasted from several foudres earmarked for the 2016 Cornas Renaissance. All showed good ripeness and richness allied to ample fruit and balanced tannins.